Immerse yourself in an evening of art and architecture at Parliament House and discover how this iconic building integrates great works of art into its structure. From Indigenous artist Michael Nelson Jagamara’s mosaic Possum and Wallaby Dreaming in the Forecourt to Peter Taylor’s timber and glass Coat-of-Arms in the Senate Chamber, you’ll discover artworks all through the architecture. 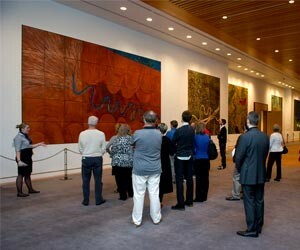 The tour also includes highlights from the Parliament House Art Collection throughout the public areas and behind closed doors.